From left, VVM Executive Director Paul Silva with board members Scott Foster and Jay Leonard. Scott Foster says the genesis of Valley Venture Mentors sounds like one of those old jokes. “A lawyer and a physicist go into a bar,” he deadpanned, adding that, in this particular case, he was, and still is, the lawyer. The physicist was Paul Silva, although he isn’t in that line of work and never really was. The bar in question was in Amherst, and what the two protagonists, meeting for the first time after taking in an entrepreneurship event at UMass, started talking about over a cold beer was the need to create a mentoring program for entrepreneurs that went beyond the existing initiatives, such as those created by the Grinspoon Foundation, focused on college students. Foster called it a “finishing school” for those with entrepreneurial spirit and an idea in some stage of development. It would take four years to open this finishing school, but the partners prevailed. They called it Valley Venture Mentors and gave it a bold mission statement — “to launch an entrepreneurial renaissance in the region.” It staged its first monthly meeting in early 2011, bringing together mostly young entrepreneurs, many of them still in or just out of college, and mentors ready to help with advice on how to take an idea to the next level, whatever that might be. To say those were humble beginnings, and that VVM has come a long way in four short years, would be an understatement. The first sessions were staged in the spacious, donated conference room of the Springfield-based law firm Bulkley Richardson, for which Foster is a partner. Most meetings drew 25 to 30 people. The organization had roughly $25,000 to work with, said Silva, now its executive director, and had no paid staff. As the agency’s name would suggest, mentoring is a big part of the equation at VVM as it goes about helping entrepreneurs get started and get to the next level. Today, the meetings are held in the Food Court at Tower Square because attendance has grown to 150 or more, and that’s the only spot big enough to seat that many. Thanks to donations from MassMutual (see related story, page A10), the state, and other sources, VVM now has $5 million with which to administer a number of programs, including those monthly meetings, pitch camps, a pitch contest that has become a pivotal component of BusinessWest’s annual Western Mass. Business Expo, co-working space initiatives, and a new accelerator program, based on the MassChallenge model, that will bring 30 emerging companies together for four months of intensive learning, sharing, and competing for no less than $225,000 in prizes. There are now several paid staff members and a host of interns from area colleges working for VVM. That profound growth shows how far VVM has come, but it doesn’t explain why this organization, still very much in the start-up phase like the companies it works with, has been designated a Difference Maker. What does explain it is commentary from those who are in various ways part of the VVM phenomenon, or impacted by it. Using different words and phrases, these individuals make it clear that VVM is making a difference by creating what many call “collisions” involving people with ideas, valuable insight in business, and capital to make these ideas reality, and, in the process, create that aforementioned entrepreneurial renaissance and spark a revival in Springfield’s long-struggling central business district. Both Silva and Foster used the phrase ‘turning point’ to describe what 2014 became for VVM and those who administer it. This was a year when the agency grew exponentially — in terms of funding, programming, facilities, publicity, and, perhaps most importantly, respect from the many constituencies monitoring its progress or impacted by its widening reach, including then-Gov. Deval Patrick’s administration and the region’s only Fortune 100 company. That upshift in momentum started roughly a year ago, when the Mass. Technology Collaborative announced that it was awarding VVM a $150,000 grant to fund its various endeavors, a development that gave the organization some exposure — and some validation that it was becoming an important economic-development initiative. 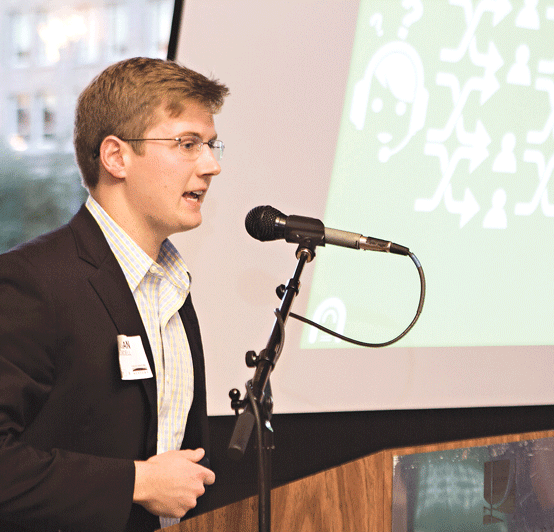 Among other things, VVM helps entrepreneurs master the art and science of the pitch. 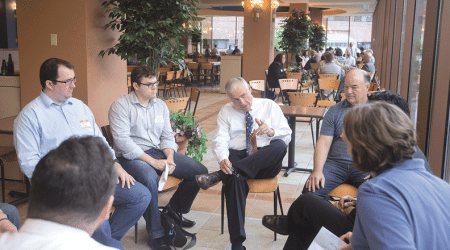 More validation would soon come from the governor himself, who met with VVM administrators in the spring, during one of his many visits to Springfield. “He essentially said, ‘I think we need to do more for you guys — you’re doing some pretty interesting things, and we can help with some capital,’” said Foster, adding that he backed up those words with a $2 million commitment to the agency. More money would come VVM’s way in the form of a $1.6 million donation from MassMutual (the company also created the $5 million Springfield Venture Fund, designed to encourage companies to locate or relocate within Springfield), and awards from the Irene E. and George A. Davis Foundation and the Community Foundation. With some of that money, VVM created physical space within Tower Square, first with a co-working space and then with a facility for its accelerator program, and made plans to become a major tenant in the Springfield Innovation Center on Bridge Street, an undertaking led by DevelopSpringfield, with construction set to begin soon. What all that additional funding, operating space, and programming does is give VVM exponentially more resources to do what it was created to do. As they elaborated on that, Silva and Foster went back to the beginning, that first monthly session, because, while the setting has changed, the rooms are bigger, and the budget involves two more zeroes, the mission, as well as the basic strategy for meeting it, remains the same. “We had 24 people at that first meeting, and Paul and I were two of them,” Foster recalled. “We had four entrepreneurs, so that means there were 18 others — 18 mentors. We didn’t really know quite what we were doing, but we knew we wanted the entrepreneurs to pitch, and we wanted the mentors to give them feedback, and we didn’t want it to be chaos. That word ‘interactions’ probably best describes what VVM is all about, said Foster, adding that they come in many shapes and sizes, and all of them could be very impactful. Entrepreneurs can interact with seasoned business owners, he explained, or with individuals who have expertise in their chosen industry, or with other entrepreneurs dealing with many of the same issues and challenges they are, and, in what would likely be the best of scenarios, they could interact with an individual or venture fund willing to invest in their concept. Parker Holcomb, who created what was known then as Five College Storage (it is now All College Storage, an indication of how it has grown geographically) while attending Amherst College, credits VVM with helping him “move the needle” with his venture, which places students’ belongings in storage between semesters and delivers them when school is back in session. “VVM was my first professional network — it was my first opportunity to interact with people, ask questions, and figure out ways to leverage those peoples’ experiences,” he explained, adding that he credits VVM with helping him expand his company to 23 schools in five states. He said it has also enabled him to sharpen his presentation skills, an important consideration for any small business that has to continually pitch its product or services, and develop accountability, something that’s often difficult in a one-man show. But while VVM’s basic mission hasn’t changed since that first meeting back in 2011, it has been broadened somewhat and certainly facilitated by many of those aforementioned developments in 2014. 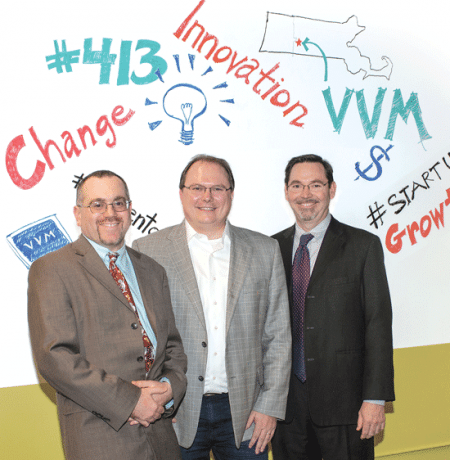 Indeed, as part of that goal of creating an entrepreneurial ecosystem, VVM is focused on not only fostering entrepreneurship and mentoring business owners, but making it easier — and more desirable — for ventures to take root in Western Mass. and remain here. And both the accelerator program and the Springfield Venture Fund should assist in these efforts, said Foster. The new accelerator facility at Tower Square opened its doors in January. The accelerator, for example, will give 30 companies the opportunity to vie for at least $225,000 in prizes that will come without strings, he explained, adding that the money is essentially a carrot. The real prize in this exercise, the reason why VVM and its funders want companies to engage in it, is to take part in those interactions, take advantage of the support being offered, and realize the many potential advantages to basing a business in the 413 area code. And Silva, a serial entrepreneur of sorts who has launched several small businesses, used his own experiences to get his point across. “I’m not from Western Mass. — I came here for school, and I was very likely to leave, like all of my friends who took off and constantly tell me how much warmer it is where they are,” he told BusinessWest. “The reason I stayed was because the embryonic version of this entrepreneurial ecosystem was here in the Valley, and it loved me and gave me help to start my first company, so that’s why I stayed. 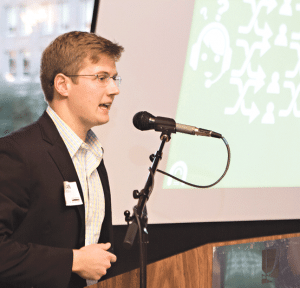 The first 30 companies in the program, based on the hugely successful MassChallenge model, which awards roughly $2 million in prize money, got down to business in mid-January. Among them is a venture called MachineMetrics, the latest endeavor launched by serial entrepreneur Bill Bither. Using patented software, the company automatically collects and analyzes data from CNC machines, sending out notifications when production falls behind. It also provides a real-time dashboard that allows operators and managers to keep tabs on production at all times. The product differentiates itself from others on the market by enabling managers to identify problems quickly and fix them, said Bither, who met a manufacturer who agreed to let his shop become a beta-testing site for the software at a VVM meeting. He told BusinessWest that he was drawn to become one of the 120 applicants for the first accelerator session because of the prize money — and the training and mentoring that can help him, well, accelerate his pace of growth. As for the Springfield Venture Fund, it made its impact felt for the first time late last year, when it provided a large portion of the $1.25 million commitment from area investors that prompted video-game maker HitPoint Studios to relocate from Amherst to downtown Springfield. More such developments are expected in the months and years to come. Looking at the larger picture, at the ecosystem created by the various entrepreneurship programs, Jay Leonard — an economic researcher for MassMutual subsidiary Babson Capital, a board member for VVM, and one of its mentors — said it has the potential to change the landscape in Springfield’s downtown. In some ways, he notes, it already is. “We’ve had more than 150 people at our last five monthly meetings, which is pretty amazing for a Wednesday night in Springfield,” he said. “At any given time, we have 10 teams involved in our mentorship program, 30 teams associated with the accelerator … add this all up, and it brings an amount of positive energy to downtown Springfield. No one involved with VVM or any other element of the region’s entrepreneurial ecosystem expects Springfield or the Pioneer Valley to become another Cambridge or Silicon Valley, probably the nation’s two most popular addresses for startup companies. But they do expect this area to increase the number of young entrepreneurs ready and willing to call it home, and perhaps dramatically. For that to happen, entrepreneurship must be fostered, entrepreneurs need to be mentored, and incentives must be created for companies to take root here, as Silva did years ago. VVM is already doing all that, and it has laid track that will enable it to do so on a much larger scale in the years to come. That’s why a fledgling agency, started only a few years ago when a lawyer and a physicist walked into a bar, is already a Difference Maker.